Home EXCLUSIVE FEATURES OPINION Lessons to learn from the just concluded elections. Lessons to learn from the just concluded elections. 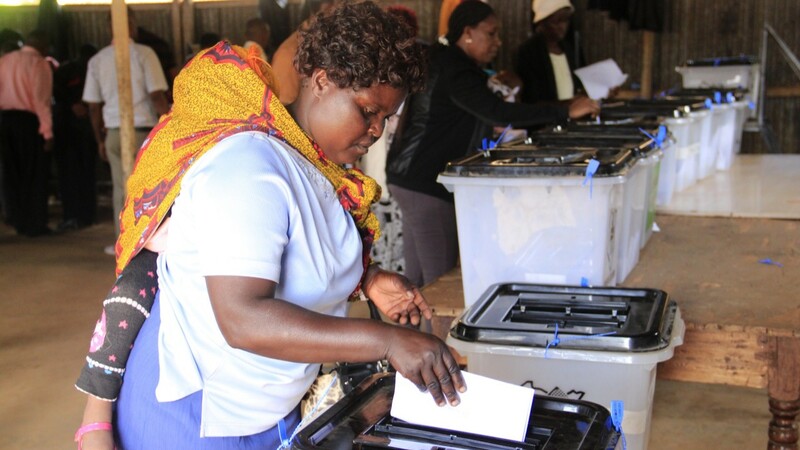 A woman casting her vote in a previous party primary. The just concluded polls brought to fore familiar recurrent themes as well as new trends. It certainly came as a surprise to many people. Kenya witnessed a kind of transformation that has never existed in her political history after popular and veteran politicians were voted out and a new crop of young and much unknown people were voted in. However, the poll results ended on the note that it is the citizens’ choice that is supreme. Here are some lessons we can learn from these results. 1. You need to ‘connect’ with the people. The polls taught us that no politician has the luxury to lose touch with ‘Wanjiku’. She needs to ‘feel’ you even when you ain’t there. These polls can be viewed as a form of protest vote, a kind of whip to punish the ‘wrong doers’. The vote was Wanjiku’s language to declare who is boss and those who had lost touch with the electorate were humiliated and shown the door. One lesson that we learnt is that any candidate who resonates with the challenges affecting with the majority of the people carries the day regardless of their political affiliation. Save for a number who sailed through due to the political party euphoria, majority of those who won in these elections were those who were able to achieve an emotional connection with the electorate. For instance, in the case of the Thika Town Constituency, Eng. Patrick Wainaina was running against a very strong Jubilee Party wave that swept almost everybody else in the Mt. Kenya region. His biggest support base were people who felt that they have been left behind in the current establishment and were angry with the incumbent’s handling of their plight. It was for this reason that Eng. Wainaina campaigned on his ability to create jobs and economic success. His message of inclusiveness and hope to the people, resonated so well with them thus their defiance to vote in the Jubilee Party candidate. 2. The baggage of office can come back to haunt you. Most challengers eyeing to unsit the incumbents were able to brand the incumbents as beneficiary of a corrupt system and biasness in terms of resource allocation, a factor that perfectly drove up their negatives. This made the challengers own outrages more acceptable to their supporters and especially when they reminded the people that those defending their seats were politicians who stood for the status quo, not good for real change. The incumbents were the ultimate face of the establishment in an election that was all about change. People who perceived themselves to be caught in an economic downdraft – their children would be worse off than they were – wanted a simple fix and these new faces seemed to provide it. 3. Wanjiku is unforgiving and never forgets. Politicians fond of playing games with Wanjiku have to brace themselves for her ‘nyaunyo’ when her time to make decision comes. Wanjiku this time showed us that she can be very ruthless towards politicians known to cheat on her, disrespect or mishandle her. To survive in the Kenyan politics, every politician MUST always mind their language and match their actions with their words because when the people say no, nothing can change that. They say that change is the only constant thing in nature. The big turnout of voters at both the party primaries and in the general elections was a clear message that people were tired of others making important decisions on their behalf. It was a demonstration that they were tired of the status quo and were determined to correct all errors committed in previous regimes. This became evident as results started streaming in with majority of the incumbents and those perceived to be forced into people’s throats were shown the door. Most greenhorns in politics adopted the slogan of change and made sure they acted on it. There will always be ‘favourites’ and ‘underdogs’ in any contest, but everything just ends there. Being a favourite doesn't mean an underdog has no chance to win it. In so many cases, underdogs have been seen to cause upsets. We saw that in the win of 23-year old MKU student John Paul Mwirigi who beat all odds to emerge victorious in Igembe South Constituency. Kenyans also showed that they are more informed in their political decisions. In the past, voters spared politicians and some politicians thought they were untouchable. In the recent polls, voters seemed more enlightened and are aware of their democratic rights. Veteran politicians and incumbents used to undermining people, misusing their power or making false promises or failing to deliver were all tossed out at the party nominations stage. 6. It's no longer business as usual. Wanjiku relayed a very strong message to politicians that she was no longer ready to be taken for granted. The era when politicians wooed the electorate with stupid goodies is long gone. Wanjiku wants someone who will bring forth permanent solutions to her woes. For the first time, Kenyans witnessed politicians sell their candidature through manifestos with others trying to outdo each other in development projects and programmes aimed at empowering Wanjiku. People are more or less not getting carried away by propaganda and rhetoric. Propaganda, though it worked in some instances, is slowly but surely getting outdated. The electorate is getting younger and more informed. They are simply demanding to know what the politicians can deliver. This is just but a beginning of a new era where issue-based politics will start taking centre stage in campaigns. It may not be time yet but Kenyan politics are on the verge of being issue-based. This was one of the most exciting part of the polls. Popular and veteran politicians were voted out and a new crop of young people were voted in. What seemed impossible was finally realised and Kenyans showed they had grown tired of the same old stories and were now ready to give chances to new blood with power of their vote. The perception that Kenyans are never involved in the decision making of their country was kicked out. More so, Kenyans set history when they elected three women as governors while a watchman campaigning in a cart was elected as an MCA. It may interest you to know that the little things leaders take for granted will definitely affect the outcome of their actions directly or indirectly. Majority of those leaders who lost in the just concluded elections assumed that the electorate ‘lived in their comfort zones’ of Runda, Lavington and the likes, forgetting that little issues like putting food on the table and Medicare really mattered to their electorate. So, when the time came for judgment, the electorate unleashed their wrath on those they perceived had neglected them and taken them for granted. Candidates from major political parties lost the election to those from little known parties and independents because these parties opted to impose unpopular candidates against the will of the electorate. It’s true that these ‘unwanted’ party choices didn’t have much of a message for the people and could not win over the people. There were warning signs of this through the campaign, as leaders of these political outfits had a lot of problems convincing the electorate to vote ‘6-piece’. The big number of independents winning in both Jubilee Party and NASA strongholds was a big lesson to them to always read the mood of the electorate and avoid having to give in to false choices like the ones that were put forward by their party officials. out at the polls and sing their tune. 10. Competition helps, not hinder parties. Party primaries are meant to strengthen democracy and not to stifle it. They give the electorate a sense of ownership and the urge to fight for the party’s ideologies. recommit themselves to rebuilding their party structures. 11. Women have a long way to go. It does need rocket science to sense that some Kenyans could not stomach the idea of a female MPs, Senators or Governors. Save for the three gubernatorial seats and a couple of women senators, the electorate decided to blackout majority of the women candidates. Sexism was dominant in this election from the beginning. However, women too are to blame for the resultant attitude due to the perception that they vie for these seat to fight men. The moment women will work on their attitude will be the moment they will start being taken seriously, not only by men, but also by their fellow womenfolk.